How to disable OST file? OST a.k.a. Offline Storage Table is an offline folder file in MS Outlook. It enables offline mode in Outlook and allows the user to make and save changes in offline mode and synchronize it with Exchange later. It becomes beneficial in cases where you have limited or no connectivity. OST files can be identified by the .ost format, with the help of this the user can work with their offline inbox and outbox locally. These changes are reflected only once the system is connected to the internet. You need to perform a synchronization process first. Synchronize all of your OST files. For this, you need to go to the particular folder which you want to sync. Go to the tools menu and select Send/Receive option and finally select the folder. If there is more than one folder, then after clicking Send/Receive and then click on Send/Receive All option. If it is a group which you want to synchronize then click on Send/Receive and select the name of the group. Next, you need to click on Tools menu, click on Email Accounts and click on View or change the existing email accounts. Finally, click on Next. On the next window, click on Microsoft Exchange Server and click on Change. In the dialogue box click on More Settings. Now you need to click on the Advanced tab and then click on the Offline Folder File Settings. Now select the Disable Offline Use button. If your offline working mode is enabled, and if your Outlook settings are set to prompt you whether you want to work online or offline. To change this, follow the below process. Go to the Tools menu, click on Email Accounts, click on View or change the existing email accounts and click on Next. Next, in the Microsoft Exchange window click on Change. On the next step, you need to click on More Settings and select the General tab. There you will see an option, "When Starting" select Automatically Detect Connection State. What if instead of disabling OST file you have accidentally deleted them? It may sometimes happen that you do not intend to delete OST files, but you unknowingly or accidentally do it anyways. Well, in that case, I would suggest you install Kernel for OST to PST Converter tool in your system. The software not only recovers all the deleted OST data but also restores missing or deleted Exchange mailboxes. After the restoring process, the software provides you the preview of the data. OST files play an important role in MS Outlook serving as the medium of work when there is no internet. In this blog, we have discussed that is how you can disable OST if you do not require them anymore. But, if you do not want them ever, then you can permanently delete them at once. 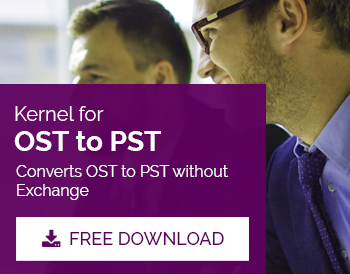 But if you're going to recover any removed or lost data, then Kernel for OST to PST Converter is the best resort.